צד אחד גיבורה מנצחת מחזיקה ראש זומבי והמילים "The Saint Z 2 2019"
גיבורה מנצחת מחזיקה ראש זומבי והמילים "The Saint Z 2 2019"
מטבע נחושת Zombucks The Saint משקל אונקיה The Saint is the tenth and final round in the ten round Zombucks series. These rounds are designed to awaken the sleeping amongst us, and to save humanity from itself! This round is a modern interpretation of the US Mint's Double Eagle gold coin, minted from 1907-1933. 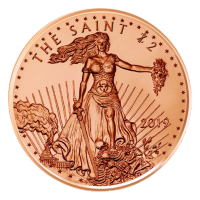 The Double Eagle is most commonly referred to as the Saint-Gaudens, after the coin's designer Augustus Saint-Gaudens. The reverse side shows a bio-hazard symbol with blood splattered around it, reminding humans of the apocalypse hazards. The words "Zombucks Currency of the Apocolaypse" leave us in no doubt as to possible future usefulness of this round. The obverse features a victorious Lady Liberty holding a decapitated zombie head. The Capitol building is on fire behind her, and she is stepping on the bones of the zombies she has vanquished. Rays of sunlight behind her give us hope for the future. As with the rest of the Zombucks series, these rounds were produced for a limited period of time.